Family: Poaceae Barnhart, genus: Panicum L., species: Panicum miliaceum L.- Cherepanov, S.K., 1995. Five millet subspecies are distinguished depending on the form of the panicle which is determined by the deviation angle formed by the first order branchlets with the central axis and by their length: Spreading millet - P. patentissimum (I. Pop.) Lyss., Branchy millet -P. miliaceum L., Contracted millet - P. contractum (Alef.) Arn., Compact millet - P. compactum (Koern.) Arn. and Oval millet - P. ovatum (I. Pop.) Lyss. 2n=36.A herbaceous annual with a fibrous root system. Millet roots penetrate soil to the depth of up to 150 cm and spread laterally to the distance of 100 to 120 cm. The bulk of millet roots is formed prior to its panicle's emergence. Millet's stalk is cylindrical and hollow. It has up to 10 nodes and is 40 cm to 2 m high or even higher. Millet leaves are alternate and consist of a lamina (18 to 65 cm long and 1 to 4 cm wide), of a sheath which covers internodes and of a stem joined with a node. The number and size of leaves vary greatly depending on specific cultivar's features and cultivation conditions. Millet inflorescence is a panicle 10 to 60 cm long. It consists of the main axis and branchlets of the 1st to 5th orders. On each branchlet's tip there is a biflorous spikelet which is 3 to 6 mm long. Unlike other gramineous plants millet has three spikelet glumes. The upper flower which is well-developed consists of two lodicules, a sessile ovary with two racemous stigmae on long styles and three stamens. Millet's fruit is a tunicate caryopsis with lodicules which are not accrete with the seed. As a rule, each spikelet bears one seed. Spikelets with two seeds are extremely rare. 1000 seeds may weigh from 4 to 5 g to 8 to 9 g. Millet seeds may be differently colored: white, cream-colored, light-yellow, red, chestnut-colored, gray, brown, etc. Common millet is a spring heat-loving plant. Millet sprouts are very sensitive to low air temperatures (-2,-3° C). Their generative organs may be damaged by short frosts of 1-2° C. During various stages of their development millet plants need rather high average daily air temperatures: from sprouting to bushing out -18° C, from bushing out to panicle emergence - 20° C, from panicle emergence to flowering - 23° C, from flowering to maturity - 21° C. Different millet varieties differ greatly as for duration of their vegetation period (from 55 to 120 days or more) and as for duration of its single stages. The stage from sprouting to panicle emergence lasts for 32 to 60 days, the stage from panicle emergence to maturity lasts for 28 to 45 days. Millet is drought-resistant and suffers less than other cultivated plants from the lack of moisture in the air and in the soil as it is able to support temporary deep tissue dehydration without greatly decreasing the yield. Millet is highly heat-resistant especially during the second half of its vegetation period. Millet is a short daylight plant. It is self-pollinating even though cross pollination may occur in 1 to 10 or 20% of cases. Flowering begins from the upper spikelets in the panicle and spreads from the top of each branchlet to its bottom. Therefore the topmost seeds in the panicle are the first to mature. Lower seeds mature later. 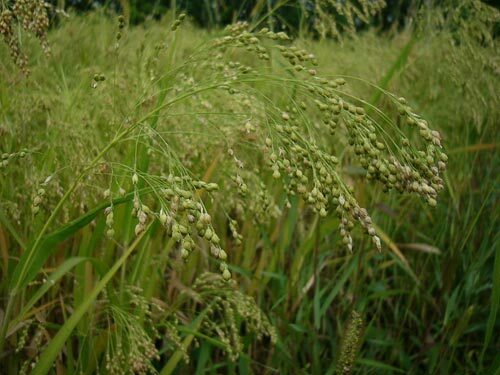 In warm dry weather blossoming of early maturing and mid-season millet varieties has been observed on days 2 or 3 after the emergence of the panicle, while late maturing millet varieties begin to blossom on days 4 to 6 and very late maturing varieties - on days 5 to 8. An individual panicle blossoms for 7 to 14 days or longer. Blossoming occurs in the following order: the flower opens up, the anthers and stigmae emerge, the anthers burst, the stigmae get pollinated and the flower closes. An individual flower may blossom for 5 to 10 or from 20 to 40 minutes. Three kinds of flowering and pollination have been observed with millet in different weather conditions. In cloudy and cool weather the flowers do not open up and self-pollination occurs. Under optimal conditions the anthers during flowering burst at the moment of their emergence from the flower and the pollen falls down on the pistil's stigma inside the flower. In this case self-pollination prevails as well but a small amount of sibbing is also possible. In hot and dry weather the lodicules open up widely, the anthers get outside the flower and the pollen spills out into the air. In this case cross-pollination occurs. It is favored by flowers' ability to stay open for a long time. Millet plants begin to blossom at 8 or 9 a.m. The peak of blossoming falls at the period between 10 and 12 a.m. And it is over by 3 a.m. During mass flowering under favorable conditions 50 to 100 flowers may open up in a single panicle. In northern millet cultivation areas loose, spreading or branchy panicles are suitable as these panicle types get more light and favor evaporation of moisture which accelerates seeds' ripening. In arid southern areas compact and dense panicles are more suitable as they reduce moisture evaporation. Common millet is one of the world's oldest cultivated plants. It has been cultivated in China and Mongolia since the 3rd millennium B.C. The greatest number of different millet varieties is to be found in China and neighboring countries. There is also "sticky" millet there whose starch is fully composed of amylopectin. Nomads carried millet from China to different Asian countries and to Europe. Most of the lands sown with millet are to be found in northern China and in southeastern Mongolia. To a lesser extent cultivated millet is to be found in Japan, India, Afghanistan, Iran and Turkey. A limited amount of lands sown with millet is to be found in Poland, Romania, Yugoslavia, Hungary and Bulgaria. Millet is cultivated in such former republics of the USSR and the Ukraine and Kazakhstan. In the Russian Federation millet is mostly cultivated in the Volga Region with its more than 50% of all millet cultivation in Russia. It is also cultivated in the Central Black Earth Belt and in Western Siberia. Millet is also cultivated in some regions of the Non-Chermozem area such as: Ryazan, Orel, Nizhni Novgorod regions and in Chuvash and Mordovia autonomous republics. In 2001 millet was cultivated on 1213 thousand hectares on all categories of farms (2.6 % of all the lands sown with grain-crops). By now 46 millet varieties have been approved for cultivation in specific areas of the Russian Federation. The main millet varieties are: Barnaulskoe 80, Blagodatnoye, Bystroye, Ilyinovskoye, Kamskoye, Kazanskoye kormovoye, Saratovskoye 6, Saratovskoye 10, Solnechnoye, Orlovsky karlik, Yantarnoye, etc. The main breeding agencies are: All-Union Research Institute for leguminous plants and cereal crops, South-Eastern Research Institute for Agriculture, P.N. Konstantinov Volga Region Research Institute for Breeding and Seed-Farming, Tatar Research Institute for Agriculture, Tulun state breeding station, Orenburg Research Institute for Agriculture, Altai Research Institute for Agriculture, Primorye Research Institute for Agriculture. Millet is a valuable cereal crop. Processed millet seeds contain 12 to 13 % protein, 81 % starch, 3.5 to 4 % grass, 0.15 % sugar, mineral salts, and trace elements: zinc, iodine, bromine and chlorine. The amount of B-vitamins (thiamine and riboflavin) in millet seeds is twice as big as that of other bread crops. Millet seed husks are one of the important biological and technical features of millet. Millet varieties with fewer husks or - especially - with thinner husks yield more cereal. However, millet varieties with 12 to 14 % of husks (and the cereal yield of 82 to 85 %) are the most economically valuable ones. With even fewer husks the seed nucleus is less protected from diseases and threshing damage. It is very important to study the inherited seed coloring as it is related to nucleus coloring. The best millet gruel can be cooked from seeds with bright-yellow or yellow nuclei. Deeply colored seeds always have bright-yellow nuclei while white or light cream-colored seeds have light-yellow or whitish nuclei. Millet seeds are used to produce alcohol and starch. On average millet yields 800 to 900 kg per hectare. Its biggest possible yield is 4,500 to 5,000 kg per hectare. Millet is a valuable fodder crop. Its seeds are of common use in pig-breeding and poultry farming where hens than eat millet lay more eggs with harder shells. Fodder value of millet straw is equal to that of medium quality meadow hay: 1 kg of millet straw is equal to 0.41 fodder units. Millet herbage is a good component of the green forage chain. It is also used in preparation of high-vitamin grass meal, granules and briquettes. Fodder millet varieties should grow fast and rapidly develop during the first half of their vegetation period. Such millet plants should be tall and have numerous leaves to yield enough herbage (35,000 to 40,000 kg per hectare) and hay (8,000 to 9,000 kg per hectare). Millet thrives on soils high in nutrients, on neuter or subacid soils, on structured unobstructed soils, and especially on virgin soils in the year of their first ploughing up. Millet's best precursors are tilled crops, winter crops, virgin soil vegetation, and fallow. Average amounts of mineral fertilizers are 30 to 40 kg of N, 45 to 60 kg of P2O5 and 45 kg of K2O. Millet is sown in spring into well-heated soil or after winter or early spring crops have been harvested. Millet is sown in closed drills, wide rows or bands. 8 to 30 kg of seeds are planted per hectare. Planting depth is 2 to 8 cm. Millet is harvested with direct or two-phase harvesting. State Register of Breeding Achievements Approved for Practical Application in the Russian Federation in 2004. Moscow: 2004. Zhukovsky, P.M. Cultivated Plants and Their Congeners, Leningrad: 1964. pp. 228-230. Cultured Flora of the USSR. Ed. Vulf, E. V. Leningrad: 1941. Individual Selection of Field Crops. Ed. Konovalov, Y.B. Moscow: 1990. pp. 202-216.